I first saw this film in the early hours of a New Year’s day, when I was about 12. After spending the week after Christmas at my grandmother’s house, my family drove home on a snowy New Year’s Eve and got in in time to watch the usual Times Square midnight countdown on TV. Mom and Dad went to bed right afterwards, but before my little sister and I could pack up the big Christmas box of Legos, the same TV station began to show a movie; its opening caught our attention. We stayed up to watch the whole thing, and didn’t get much sleep afterwards. “They call them the haunted shores, these stretches of Devonshire and Cornwall and Ireland which rear up against the westward ocean. Mists gather here, and sea fog, and eerie stories. That’s not because there are most ghosts here than in other places, mind you–it’s just that people who live here are strangely aware of them. You see, day and night, year in, year out, they listen to the pound and stir of the waves. There’s life and death in that restless sound, and eternity too. If you listen to it long enough, all your senses are sharpened. You come by strange instincts. You get to recognize the peculiar cold that’s the first warning, a cold which is no mere matter of degrees Fahrenheit, but a draining of warmth from the vital centers of the living. “Local people tell me they would’ve felt it, even outside that locked door. We didn’t. They can’t understand why we didn’t know what it meant when our dog wouldn’t go up those stairs. Animals see the blasted things, it appears. It takes stronger wills or much more sleepy heads than two little girls possessed that night to turn the TV off after such a tantalizing beginning. I’m glad I had the chance to see it then; it’s not a movie that’s been widely shown. Before it came out on DVD a couple of years ago, I don’t think I’d seen it more than twice in the 40 years since that initial viewing. Unlike a lot of spooky movies I enjoyed in childhood, this one lives up to my first impression. It’s still a great ghost story with a ghost that still looks very good. Siblings Roderick (Milland) and Pamela (Ruth Hussey) Fitzgerald are just at the end of a holiday in Cornwall and taking one last walk along a coastal path on that rocky shoreline. The path takes them up to the back lawn of an empty house. Their terrier Bobby chases after a squirrel, following it into the house by way of a partially opened window; the two go after the dog and, while they are running from room to room after Bobby and the squirrel, Pamela can’t help noticing what a gorgeous place it is. A bit cobwebby, but in surprisingly good condition. Rick agrees that it’s very like the home they grew up in. Their conversation implies that their family was once wealthy and, while they’re not poor now, they’ve come down a step or two since their parents’ deaths. They share a flat in London. Rick works as music critic for a newspaper, but what he really wants to do is compose his own music. As they continue to explore the rooms, Pamela has a sudden “feeling” that they’re going to live here. Do they have enough money between them to afford a house like this and live in it while Rick works on his music? Well, let’s find out who owns it, make an offer, and see. Inquiries about the house lead them to the home of Commander Beech (Donald Crisp). 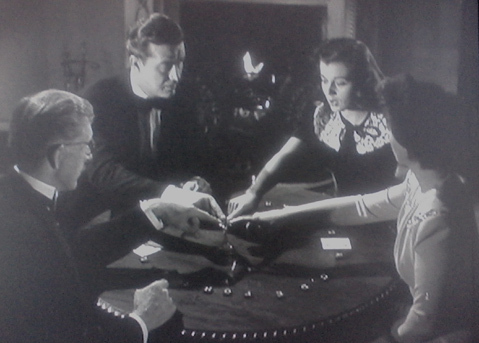 He isn’t at home, but his granddaughter Stella (Gail Russell) receives them and tells them that the house, Windward, definitely isn’t for sale. Then the Commander comes in and immediately contradicts this statement. He’s so eager to sell Windward that he accepts the Fitzgeralds’ initial low offer of 1,200 quid. What’s wrong with Windward? they wonder. It’s isn’t haunted or anything, is it? Commander Beech rejects this ridiculous suggestion, but admits that the last people he rented the house to left abruptly with stories about “disturbances”. The wind and the sea make odd sounds that prey on the imaginations of overly sensitive persons. He can put up with renters reneging on their agreement, but the sale of the house must be final. Pamela and Rick are hip and modern young Londoners (Rick in particular is something of a smartass); they don’t seriously believe in ghosts at this point and “disturbances” won’t disturb them. Pamela’s already in love with the house. They accept the bargain. Rick plans to go back up to London to arrange to send their furniture down and take care of other necessary business, and Pamela will stay at the village inn while she makes their new home habitable. First, they return to Windward together with the keys in hand to have another look around. There was one locked door at the top of the grand, sweeping staircase, and they’re both curious to see what’s on the other side. It’s an artist’s studio with greenhouse-like windows in place of one wall overlooking the sea. In spite of this spectacular view, Pamela calls it the one ugly room in the house. Rick speaks of making it his own workroom, and then falls into a sudden fit of despair about whether or not he really has what it takes to write his own music. Neither of them notice that the little bundle of flowers Pamela brought in with her wilts as if it’s been blighted by a frost. But the Fitzgeralds can’t help noticing when Bobby howls at the foot of the stairs and absolutely refuses to come up and join them. From a window on the landing, they see Stella standing on the lawn and staring at the house. Pamela thinks she looks like she’s been crying. Before he returns to London, Rick meets Stella on the streets of the village. She apologizes for her lie about the house. It isn’t that she doesn’t like the Fitzgeralds, but that Windward was her mother’s home. Stella was born there, although she hasn’t lived in the house since her mother, Mary Meredith, died when she was three. Her father, the artist who painted in that studio, went away to the Continent and died there a few years ago without ever seeing Stella again. He once sent her a bottle of her mother’s favorite perfume, mimosa–that and a portrait of Mary are all the young woman has to remember her mother by. And there’s Windward, even though her grandfather has never allowed her to return to the house since her childhood. She’s been around the outside, but never gone inside. Rick says they’ll have to have her over and asks her to call on his sister while he’s away. Three weeks later, Rick returns, bringing with him an elderly Irish woman named Lizzy Flynn. She used to be their nanny and will now be their cook / housekeeper. Lizzy still speaks to Rick and Pamela as if they were children, and brings with her a cat. The cat, like Bobby, refuses to go upstairs when Lizzy tries to take it up to her room. It becomes a hissing puff-ball of fear over something it sees on the stairway that the humans don’t. What of Bobby? Pamela explains that the dog ran away soon after she moved in. She’s more tense and reserved than she was when we, and Rick, last saw her, but she won’t tell him what’s happened. When he asks, she does say that Stella hasn’t come to see her and, when she sent an invitation to tea, the Commander wrote back and refused on his granddaughter’s behalf. Rick will learn for himself why Pamela’s so tense at about 5:30 the next morning, when the sound of a woman’s heartbroken sobs wake him. Thinking it must be his sister, he ventures out onto the landing at the top of the stairs. Pamela meets him there, and she obviously isn’t the one crying. Is it Lizzy? No, Pam answers. It’s not Lizzy. She’s heard the weeping woman before, not every night since she moved in, but often enough. And she’s been here alone for weeks. The sobbing sounds as if it’s coming from downstairs, but Pamela tells her brother that it’s useless to try and locate it; the sound comes from “nowhere and everywhere.” Her answers are creeping Rick out and he keeps telling her not to be frightened as he grows more nervous himself. Pamela says that the sound usually stops at daybreak–and, on cue, the dawn breeze wafts through the landing window and the first faint gleam of daylight can be seen. The sobbing stops. The siblings return to their bedrooms, Rick now spooked enough to put his head under the covers. Later that same Sunday morning, he calls on Commander Beech, not only to ask about the history of Windward, but to find out what’s going on with Stella; she’s been on his mind during the weeks he’s been away. The Commander once again calls the idea of a haunting “bosh” and attributes the sobbing sound to the wind in caves under the house, although he says that there was never any sound during his own grandparents’ time, when the house was built, or any time since. So the sounds have only been heard since his daughter’s death? The Commander takes offense when Rick says this. Rick hastily adds that he’s not suggesting that Mary is haunting Windward–and then he realizes that this is exactly what Commander Beech does believe, and it’s why the old man won’t let Stella enter the house. He’s afraid that she’ll be in danger if she does. Rick runs into Stella as he’s leaving the Commander’s house and the two have a surreptitious conversation in his car as he gives her a lift to church. Stella is 20, and meeting a brash young man like Rick inspires her to assert her own independence. She defies her grandfather and accepts a dinner invitation at Windward. The Commander’s response is to phone a mysterious person named Miss Holloway. We don’t know a thing about her at this point beyond what we see when she answers the phone. Miss Holloway has an enormous, beautifully decorated office, and a portrait of Mary Meredith on one wall even larger than the one Stella keeps in her bedroom. Dinner at Windward starts off well. Rick shows Stella his music studio–the room that used to be her father’s–and plays part of the piece he’s been working on. It’s called “Stella by Starlight” (and it became a big hit a few years after this movie’s release). Stella is in turns impressed that he wrote this lovely piece himself and that he wrote it for her. You’d think that this would immediately lead at least to some serious kissing if not an engagement, but the spirit of despair that haunts the studio kicks in before things progress very far. Rick must have done most of the work on his sonata while he was in London–he couldn’t have been inspired to write something beautiful in the deadly atmosphere of this room. As he continues to play, the candles on the piano flicker and grow dim, and the music takes on a darker tone. Stella is suddenly depressed and wonders how she ever thought she could laugh in her house. She leaves the studio and flies downstairs, but before Rick or Pamela realize what’s happening, their guest is running across the lawn and heading straight for the edge of the cliff! Rick catches her just in time. Stella has no idea what she was about to do. They’re still on out the lawn when Lizzy shrieks inside the house. Rick and Pamela rush in to see if she’s all right. Lizzy tells them that she saw something at the studio door, something that she first describes as “a crawling mist” and then as the ghost of a woman. She refuses to stay another night in the house, although she’ll come back to work in the daylight hours. Stella, meanwhile, has gone back up to the studio and passed out on the floor. The room is icy cold. The Fitzgeralds put her to bed in the ground-floor guest room that used to be Stella’s own childhood nursery, and dinner becomes a few spoonfuls of soup before she falls asleep. They also call up the doctor from the village to have a look at her. It turns out that the doctor found the missing Bobby in the village and has given the dog a home. Dr. Scott is also an eligible bachelor, since it isn’t fair that Rick should have a romance and Pamela doesn’t. While Stella is sleeping in the former nursery, a soft light and the scent of mimosa emanate from the room. But Stella isn’t depressed or frightened this time. She says that the spirit meant her no harm; on the contrary, for the first time she can remember, she feels truly loved. She’s certain she’s had contact with her mother. She doesn’t want to leave the house, but after what occurred that night, the Fitzgeralds insist it’s better she not come back to Windward. The doctor drives her home. Pamela is hopeful that reaching her child is what the ghost of Mary Meredith wanted too, and now she can be at peace. The haunting should be at an end. After the others are gone, Pam and Rick go up to the studio–and find it as cold, horrible, and depressing as it’s always been. Something is still in there with them. The sobbing hasn’t stopped either. Rick and Pamela have been gathering bits and pieces of the story of the Merediths and how Mary died from Stella, the doctor, and other gossipy village sources. To sum up what they’ve learned so far: Meredith had a model, a “wild Spanish gypsy” named Carmel. Artist and model had a fling that Mary put up with for as long as she could, but eventually the couple went on a trip to Paris, where they found Carmel another job and left her there. After the Merediths returned to Cornwall some months later with their new baby daughter, Carmel showed up again and the artist took up with her again. When Meredith cast her off a second time, so the story goes, Carmel tried to commit suicide by throwing herself off the same part of the cliff where Stella was headed. The saintly Mary tried to stop her rival and, while they were struggling, went over the cliff instead. Carmel fled into the rainy night and died a few days later of pneumonia. There’s some speculation that Carmel pushed Mary deliberately. After this night, it becomes obvious to the Fitzgeralds that there are two ghosts at Windward–one that loves Stella, and one that hates her and wants to kill her. The Fitzgeralds and the doctor agree that as long as there’s a danger to Stella at Windward, she should be kept away from the place. Rick’s idea is that he and Stella should get married and he should take her off to live in London, but Stella doesn’t want to go so far away now that she believes her mother’s spirit is near her. How to convince her that getting as far from Windward as possible is what her mother wants for her? They decide to hold a seance! As one does in such situations. They don’t have a Ouija board, so they make do with some Scrabble tiles and an upturned wine glass for a planchette. To contact the spirits, they have to bring Stella back to the house one last time before they send her from it for good. Rick and Dr. Scott plan to spell out a message supposedly from Mary, but Stella knows right away that they’re holding the glass down and tells them to take their hands off. Another force takes control of the glass and tells Stella that it remains at Windward not just because it loves her, but to guard her. Guard her from what? she asks. C A R M E L is spelled out, then the wine glass flies up to dash itself to fragments in the fireplace. Stella goes into a trance and begins to speak fiercely in Spanish, a language that none of the others know. The best I can make of it is that she says something about a baby, and about lies, and her love. While this is going on, there’s a knock at the front door. The group around the table is too engrossed to notice at first, but when Pam gets up to answer it, the way is blocked. A misty figure like a woman’s head and upper body wrapped in a shawl manifests near the door to the room and begins to come closer to them. The knocking on the front door continues throughout this scene, until the person finally goes around to the back of the house to burst in through the French windows. It’s the Commander, and he’s not at all pleased to see his granddaughter there, sprawled unconscious and recovering from her trance state. Furious, he bundles Stella up and has the doctor drive them home. After they put Stella to bed, Commander Beech stiffly informs Dr. Scott that his medical services will no longer be required. Someone else will attend to Stella thereafter. As a matter of fact, he’s already made arrangements for his granddaughter’s care. 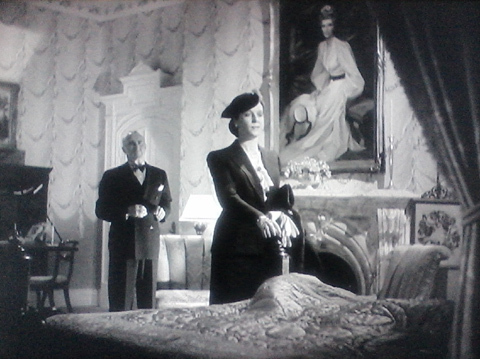 Mystery woman Miss Holloway (Cornelia Otis Skinner) is at the Commander’s house and after Dr. Scott is dismissed, she takes Stella away with her that same night. That spacious, posh office we saw earlier is at the Mary Meredith Memorial Retreat for mentally unbalanced but non-violent women. Health Through Harmony is its motto. The chilly Miss Holloway is the Retreat’s founder and administrator. She was Mary’s best friend from girlhood. (There are hints that she and Mary were more than friends, hints as broad as could be made in the 1940s and gotten away with). Miss Holloway can tell the Fitzgeralds all they want to know about Mary and Carmel and how both of them died when they visit her the next day, unaware that Stella is now a patient at the Retreat. A second version of events emerges. On the night that Mary died, the gardener heard a child screaming out on the cliff’s edge. Rick and Pamela ask about this, and Miss Holloway tells them that she was there and witnessed what happened. When Carmel tried to kill herself, she also tried to take little Stella with her out of jealousy, and Mary died trying to rescue her child. 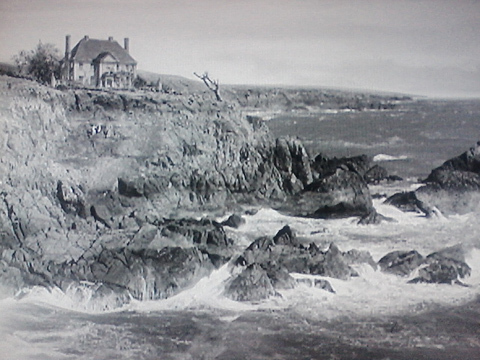 Miss Holloway says that she definitely saw Carmel strike Mary to send her over the cliff’s edge and that, in spite of that, she did all she could to nurse Carmel during her pneumonia. There’s something more the viewer may have guessed about Stella’s parents and the incident on the cliff by this point. Rick and Pam haven’t yet put together all the pieces of the puzzle, but they don’t entirely believe Miss Holloway’s story. When they get back to the village and talk to Dr. Scott, the Fitzgeralds learn where Stella is. From the old medical records written by the doctor’s predecessor, they also discover that Miss Holloway’s nursing of Carmel wasn’t as attentive as she claimed; she seems to have left the bedroom windows wide open in freezing weather while looking after her pneumonia patient. Convinced that Stella is in nearly as much danger from Miss Holloway as she is at Windward, the three of them plan a rescue party. When she hears that the Fitzgeralds are coming back to the Retreat to get Stella, Miss Holloway tells Stella that she’s free to go, that the best thing for her is to return to Windward. She sends the girl off to catch the next train, so that Stella is on her way before her friends arrive. By the time the Fitzgeralds and Dr. Scott do get to the Retreat, it begins to look like Miss Holloway should be an inmate at her cozy mental home instead of the woman in charge. Stella reaches Windward first… but the house isn’t empty. The sound of labored, rasping breathing draws her up to the studio–it’s the creepiest moment in the movie until Stella gets upstairs and finds it’s not one of the ghosts, but her grandfather. A phone call has sent him rushing over from his own house to intercept her, and the effort and excitement haven’t done his weak heart any good. The appearance of the misty ghost in the doorway behind Stella gives him a heart attack and finishes him off. Stella turns and sees what she takes to be her mother’s ghost. She’s not afraid, she insists. She’s not afraid. And then she screams. For the second time, Stella dashes for the cliff’s edge. Will Rick arrive in time to rescue her? Well, of course he does. This isn’t the kind of movie where the heroine dies tragically at the end. This is the kind of movie where all the pieces finally fall into place at the last minute, and the smart-mouthed hero gets to have a dramatic showdown with the evil ghost on the stairway. I really like the visible ghost in this story. It’s not one of those cheap and cheesy double exposures that never look like they’re in the same scene as their surroundings. She looks like a ghost should look, forming slowly out of swirls of mists until her face becomes clear. It holds up very well, considering how old this movie is. The DVD was a Criterion release, so the film has been cleaned up and the plays of shadow and light in so many scenes stand out with striking clarity. There are a couple of interesting additional features as well, radio versions of the same story that were broadcast after the film’s release, and a documentary about the making of the film. 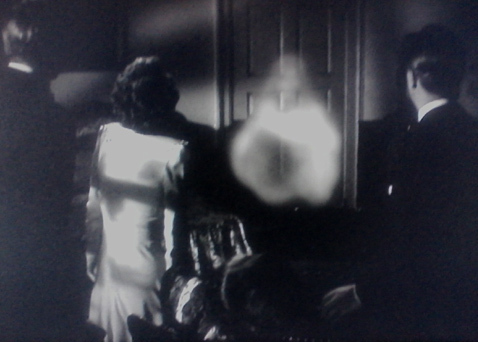 The narrator doesn’t seem to think much of The Uninvited‘s plot and dismisses it as overly complicated, but he does speak highly of Gail Russell’s performance and discusses the nature of “ghosts” in old movies; everyone you see recorded on film here has, after all, passed on. There are also biographical segments on Ray Milland and Gail Russell, whose life was sadly short and tragic, and a piece on spiritualism.